It definitely lies in the centre. I debated with a friend who said it lies west, in Rajasthan. One said it is in Gujarat, and another, slightly down south in Andhra Pradesh. Well, to each his own. Everyone has their geographic theories of where the heart of India’s summer lies. For some it has been found in Mumbai (I couldn’t argue there: the already hot seaside city is slowly turning into a tangle of concrete buildings and tar roads – a soup for the heat island effect monster). But the historically famed and geographically appropriate location lies indeed at the very heart of India, in the central Indian highlands where temperatures commonly cross the 40 degree mark, when everything seems to stop. I call it the summer freeze. I have experienced only snippets of summer in India’s heart in my native place of Nagpur, but it was really in the recesses of Madhya Pradesh where I truly experienced it: in its searing grasslands and its leafless deciduous forests – but curiously, also in its splash of colours of Palash, of Kusum, of Sal; in its flavor of Mahua, of Sal’s subtle scents, of the emerald greens and ebony browns; in Kipling’s stories, in Forsyth’s essays, in culture of this place. I tried to find the warmth associated with “heart” as opposed to the wrath experienced in summer. The heart of India’s summer, therefore, shouldn’t be considered with the wrathfulness but the warmth that dwells in the hearts of the people of this region and their ancient association with summer. It all started in February like every year, but the heat was felt in the early weeks of March with the onset of summer thunderstorms. They were wild, windy, and terribly flashy. But just as they came, they passed away. Some lasted not more than an hour, but were loud enough to wake you out of your sleep. Then they became sporadic, but every once in a while the clouds hang low in the sky like a curtain – silently shrouding the vast plains of Kanha. Then the word was out of what people were afraid of, a whisper of death. A subtle but forceful entity of the summer – you can call it the sun’s wind unleashed by the Sun itself upon the saucer of central India. This entity works upon you slowly and steadily – if it finds you out working or even merely travelling under the bare blue sky, it will work its charm upon you with a deathly skill. Indeed, you will not realize why or how you fainted – for the loo will strip you of your water without you ever realizing it, and knock you off your feet with a heatstroke. Traditionally called the “loo” this wind propagates from the hot sands of northwestern Indian subcontinent, and cascades eastwards over the Indo-gangetic plains and the plains of central India as a continuous chain throughout summer, stealing moisture from the air, and water from life. The trees pre-mediated to conserve water instantly drop their leaves – and the dead leaves echo on the forest floor with the blowing wind… settling in clumps where the loo cannot reach. But just as so happens, just when you feel the wrath of sun’s wind, some trees begin to flourish – new flowers, new leaves, new scents linger in the air. The loo which we looked at with fear turns softer and cooler in these forests – particularly the Sal forests, and converts it from a curse to a blessing. This wind of change marks the beginning of another season for a number of trees and animals, and mankind, as everyone readies for a new life – colours, dances, and marriages, even territorial fights, peak in summer. This essay is but one of the stories I had the fortune to witness in central India, one I am never going to forget. I had to keep aside all others to give this historic story its focus, without meaning to belittle the significance of many other stories which shall follow as seasons pass by. The heart of India’s summer, as I emphasized on before, is crucial for the ecosystem of this region, and by extension to its people. Whether by need or by necessity, they have become bound to this season – and this unique bond is seen not in India’s hot cities but solely in its villages and its wilderness. For in the cities summer and man are separate, almost sworn enemies, in villages it is more complex – there is no enmity, only tolerance. This is where this essay lies in, looking at the life of man dependent on summer. Amidst all the vivid transformations taking place in the central Indian highlands, this struck me as the most romantic – of Mahua and her people. What was once a tangle of herbs and shrubs is all but gone. 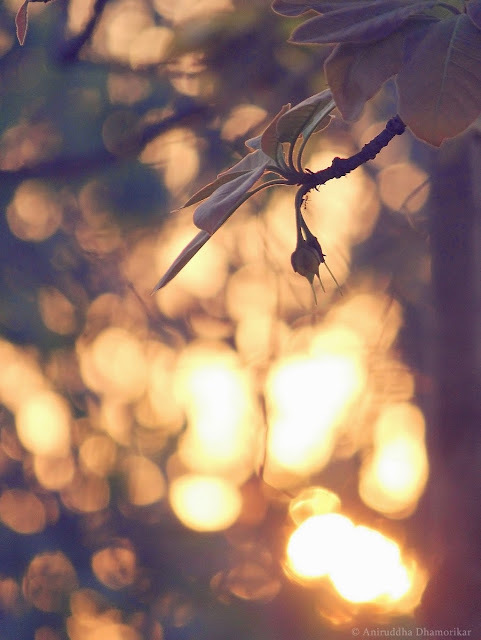 Pieces of clothes, some blue, some pink, some bleached white in the searing sun, dangle by low-hanging branches of Mahua trees. The ground below is cleared of its bramble using fire and grass-brooms. It’s so reverently cleaned that even the holy banyan tree standing for decades by this tree of Mahua seems jealous of it. For this is Mahua, the gift of the Gods to the people of India – and the tree is more revered here in central India than anywhere else on our planet. 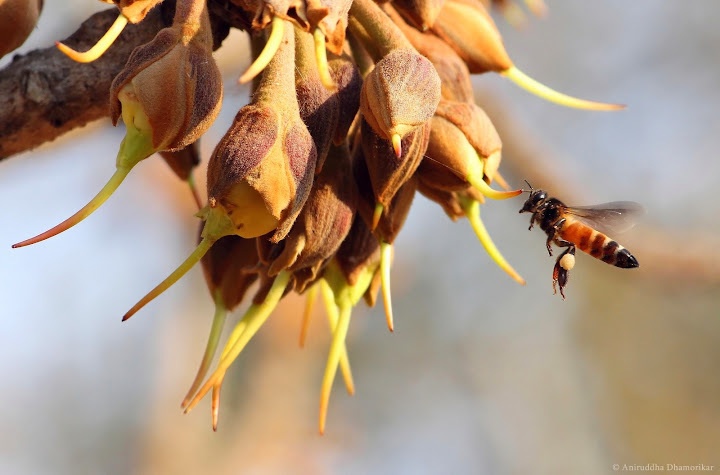 “Mahua” is derived from the Sanskrit word madhu, meaning honey. It is one of the few trees well known for thousands of years. According to Awasthi et al (1975), the economic importance of Mahua is mentioned in ancient Sanskrit literature such as Vedas and the Ayurveda, as well as in travelogues of foreign travelers. The Persian invaders to this land centuries ago named it Darakht-i-gulchakan due to the deciduous nature of its flowers. There was – and still is – something about this tree worth observing. I tried to visit some old records of central Indian highlands as were freely available in order to connect history with present, and present with future – solely of Mahua and her people, and found that Mahua appears in historic records, song, cuisine, and culture as a sacred entity worthy of a Goddess, and plays a unique role in an ecosystem that has no competition left from other trees. This is but an excerpt of the story of Mahua and her people which is largely unwritten and untold. and fruits April onwards up till May. The first tree noticeable as one passes through the fields of central India are trees roughly round in shape with broad leaves, and, if you’re passing through in early summer, with bunch of brown blossoms at the end of their branches. These trees will dominate your views as far as the farms stretch, sporadically mixed with other trees such as Mango, Jackfruit, and rarely Jamun and other forest species. These Mahua trees are here for a reason, and precede the age of any man alive today. Indeed, many of them have been a part of the virgin forest which once stood here before people cut them down for farming. Authors like Captain J. Forsyth have mentioned Mahua as an important tree of central India, and much of what he said 100 years ago still holds true. 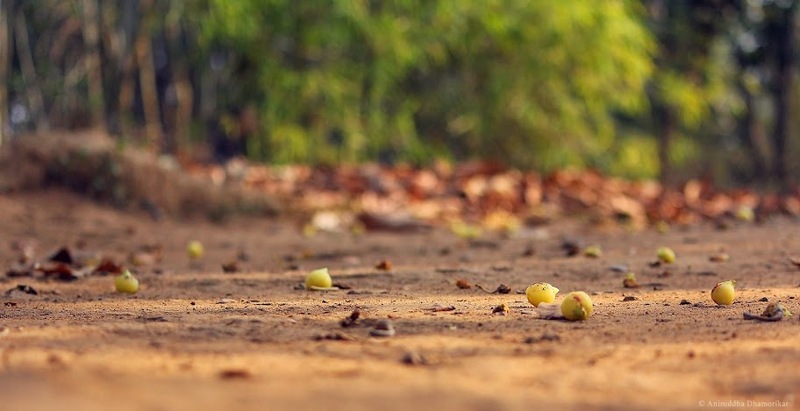 His essay is especially worthy to note on some of the early (and present) uses of Mahua, by man and animal alike, and has made a distinct note on the question that has been lingering in my mind since the beginning of summer – about the graceful Mahua trees standing tall when all the other trees were cleared for agriculture. 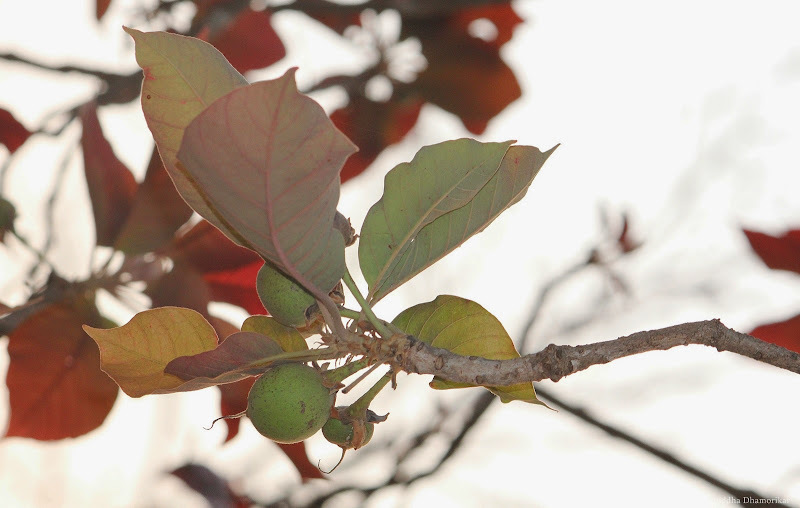 “The Mohwa (Bassia latifolia; now Madhuca indica) is one of the most useful wild trees in this part of India. It is not cut down like other forest trees in clearing the land for tillage, its value being at first greater than that of the area rendered unproductive by its shade and roots […] The reason of this I believe to be that, during the “times of trouble” referred to in my first chapter, the majority of the small proprietors of the land were ousted from possession of their fields; but the custom having been established that possession of the fruit trees growing on it did not necessarily pass with the land, they mostly retained the proprietorship of these trees. Thus it has happened that the land is often owned by one party and the trees by another. The rent is paid only by the landholder; and thus, thought it would pay him to clear off the trees, it would not pay the tree-man; and so they have remained doubtless to the very great advantage, and certainly to the beauty of the [Nimar] district. Today, majority of the trees standing in agricultural fields that were once a mixed deciduous forest are Mahua. This is probably the one thing that shows how crucial Mahua is to the people of the region. Given its economic importance, I however still wonder why people do not undertake plantation of Mahua as a hedge tree – and to find this out I asked around but nobody seemed interested about it. One of my good friends, Charansingh, told me that there are so many Mahua trees naturally growing about us, plantation of new one is rather unnecessary! Maybe he is right, whatever the ration provided by Mahua today, as it did a hundred years ago, comes from natural forests. To harvest a double load of Mahua will also require as much storage and primary processing which is generally undertaken by the collector itself, and given the constraints – from land to manpower, it is perhaps difficult to attain this. Furthermore, Mahua is considered as a minor forest produce (a non-timber forest product), and tribal communities are permitted to collect and sell the yield in the market. This forms a crucial part of the local economy especially during a season such as summer when water is unavailable for agriculture. Mahua thus earns an income to the family. In case the number trees were increased for commercial production, there could be a surplus of Mahua produce, leading to a fall in its price which may hamper the means of earning for a poor family. 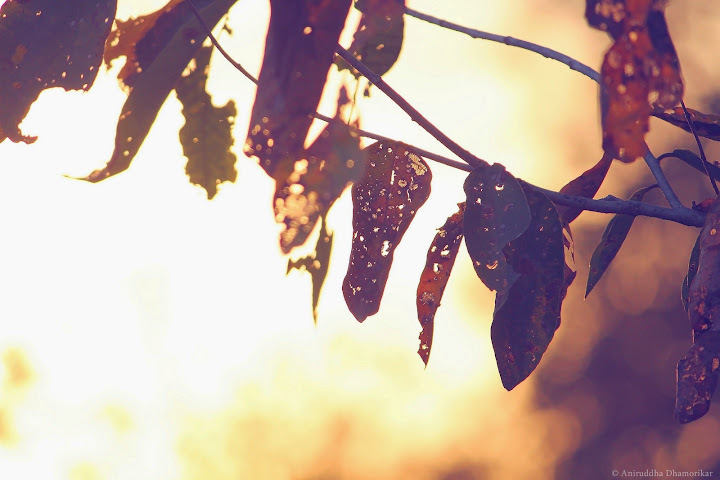 In a way, Mahua and other produce obtained from forests are the best examples of ecosystem services to mankind – providing man with enough to tolerate summer – in other words, such trees, including Tendu, are the ones that keep people hopeful for a summer. It is only obvious, then, that the season be celebrated! 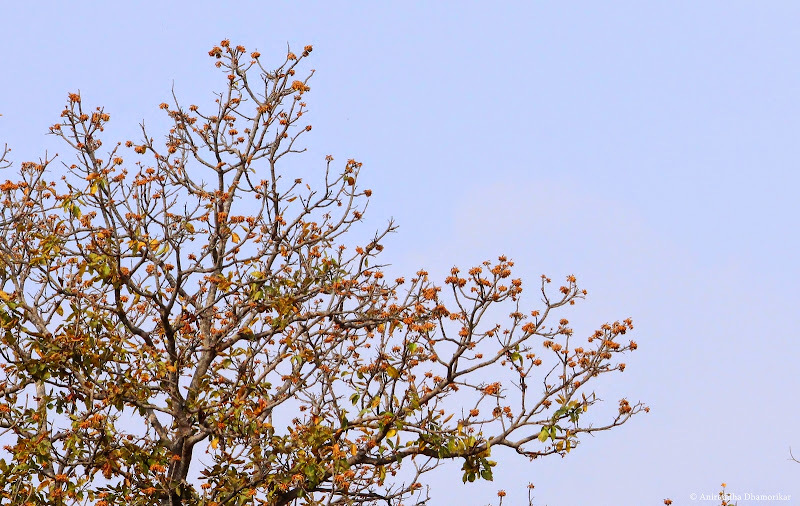 Mahua has found its way into a number of song and dance, and is still sung about in summer. I am told the songs are worth dancing to, and are traditionally called karma geet. Mahua blossoms are poetry in itself. Its berry-like juicy corolla supports thin pale-green petals, hanging gently in a bunch. Late at night and early morning, the flowers drop to the ground, attracting man and animal alike. They have a very strong organic, sweetish taste that fills your senses with awe – but one can never eat more than two. While on the tree, the flowers exude a thick dust of pollen if shaken. This pollen is even more treasured by the pollen hunters – bees of different shapes and sizes – from the tiny leaf-cutter bees to the large honeybees, all of them visit the flowers, rest against the slender stigma, stick their long tongues in the opening, and inadvertently rub their legs carrying pollen onto the stigma – and, in the process of collecting the pollen, pollinate the flowers. However, it is considered that Mahua is anemophilic (wind pollinated). 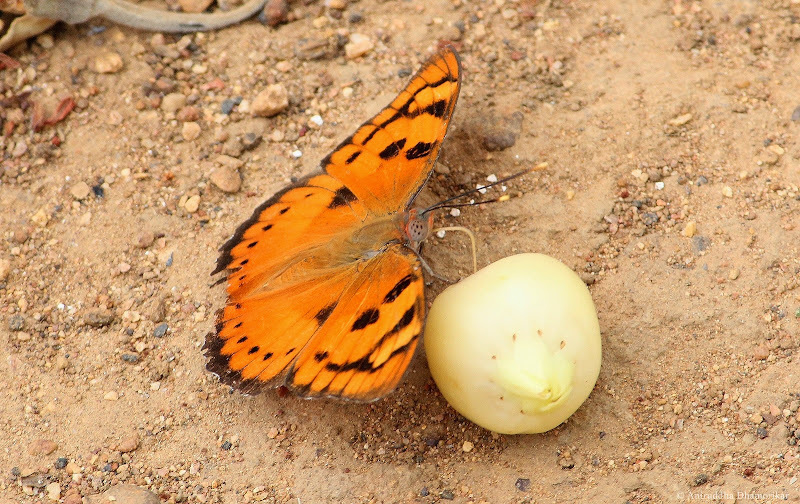 Then, the corolla which surrounds the stigma carefully drops off carrying anthers and petals, leaving the stigma and the ovaries to fertilize and produce a fruit. These fallen flowers, once they have done their crucial job of attracting pollinators, serve another purpose. a group of anthers and cloud of pollen. The stigma passes through the hollow in the middle of the flower. Early in the morning villagers set out to their specified trees and collect fallen flowers. Some of them light a fire and settle in at night by the trunk of the tree after dinner because stealing is rampant, and Mahua is as precious as gold. The people also have to defend their tree from wild animals that are as keen about the fallen flowers as man. 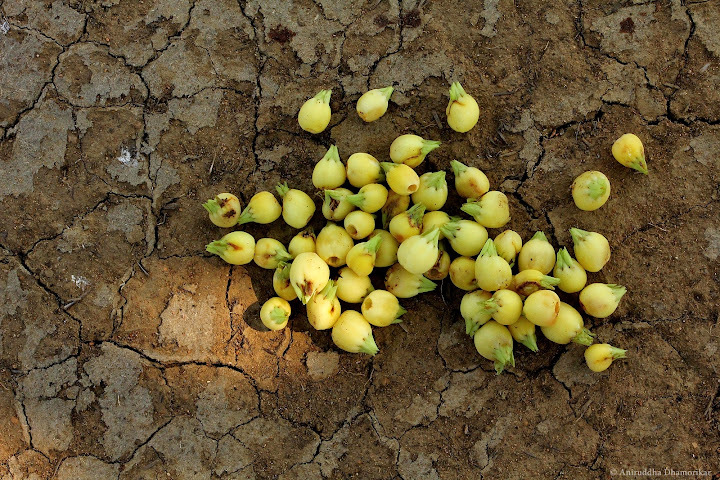 The fallen Mahua flowers are then collected, sorted, and laid out in a clearing under the sun to dry. The drying is usually undertaken by individual families – a community participating in drying is uncommon, since the number of trees owned by a family varies greatly. The dried flowers are then stored and, when the price is right, sold off in the market. During the harvest period, the collectors come across some of the spectacles of wildlife – amusing as well as frightening. It is recorded that elephants, deer, bears, and monkeys are lovers of Mahua, and engorge themselves with so many flowers that it ferments, and intoxicated they sway around drunk as a skunk! On the other hand, since summer is also a season of preparation for breeding, there are terrible fights between some animals. Santu once informed me about dancing snakes in a shriveled field, by the shade of Mahua which was at its last flowering stage this season. These were two bold and beautiful Indian Rat snakes (Ptyas mucosa), engaged in a fearsome territorial battle. This battle is often mistaken for a dance between a male and a female snake, and the local people here believe one of the snakes to be a highly venomous Cobra, and the offspring from this union to be of an even more fearsome snake. This behaviour is in fact two rival males fighting over a territory – the twining and rising up to dance as if in love – is actually their way of thrusting the rival to the ground. It is said that such fights can go on for hours, and at the end the winner often chases away the loser out of his land. Those who have come to collect Mahua and have witnessed this will not come to that place again until tomorrow. There are several research publications exploring the medicinal properties of Mahua – from its bark, leaves, flowers, fruit, and seed. Traditionally, however, only flower and the seed are majorly utilized – mostly for production of liquor from flowers and oil from seeds. Sunita and Sarojini (2013) quote Banerji and Mitra (1996) about Mahua being a multipurpose forest tree species that provides an answer for three major F’s: food, fodder, and fuel. The raw, freshly harvested flowers which are mostly dried and sold, are useful and healthy if consumed without drying. I also explored a bit of off-the-menu recipes of Mahua. This I think is crucial to understand its economic and nutritional benefits to local communities. When the sabzi was made, Mahua was in full bloom, and we, as insects, birds, and mammals, enjoyed to our utmost best. Here are two of the dishes I enjoyed learning, and eating, from my friend Dayal. 1. Collect Mahua flowers early in the morning. This is important if you don’t like insects licking your food. 2. Clean the flowers of its anthers and petals. Retain the fleshy corollas. (For this, you will need to break one side of the fleshy, round corollas and, using your finger, remove the anthers and the petals manually.) Wash if unclean. 3. Boil it for about 25 min. to reduce excess sugars (which can get you drunk). 4. Filter out the water. 5. Put 1 teaspoon oil in a separate pan. 6. Add raai (mustard seed) and Curry-leaf to it: Now you have raai-tadka. 7. Add cleaned Mahua flowers to it. Sauté it until it turns very slightly brown. 8. 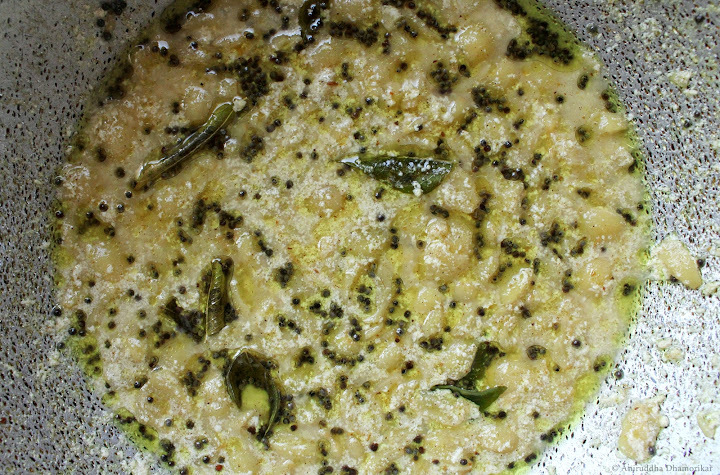 Add dahi (curd): ideally half or 3/4th the amount of Mahua to the pan. 9. Add salt; chaat masala; black chili powder according to taste. 10. Mix the ingredients for approx. 1 to 3 mins. 11. Serve hot or cold! 12. This dish (raita) tastes sweetish because of Mahua, and tingly if the curd is a bit bitter. 13. It goes down the throat well with roti and a spicy sabzi, and, if you like, Mahua. 1. Follow 1 to 4 steps as above. Keep it aside. 2. Add 2 teaspoon oil in a pan/ kadhai. 3. 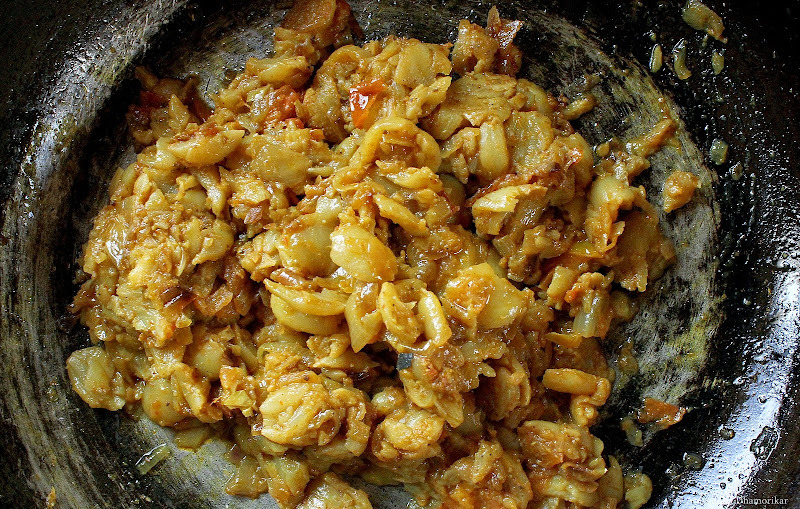 Add cut pieces of onion and tomatoes (half the quantity of Mahua). 4. Stir. Once it turns brown, put any of vegetable masala (we added Kitchen King). 5. Add half teaspoon of Coriander powder, red chilli powder, turmeric powder, and salt. 6. Now add Mahua flowers to it. 7. Stir it for about 10 minutes with an interval of about half a minute every 3 minutes. 8. Once Mahua turns slightly brown, the dish is ready. 9. This dish tastes spicy and fleshy because of Mahua. 10. It goes well with roti and rice. Interestingly, not many of the local communities consume Mahua in this way. Baiga’s don’t eat Mahua, they only drink it. The Baiga tribes probably have the oldest connection with Mahua than any community across the world. Their ritual connections run deep. 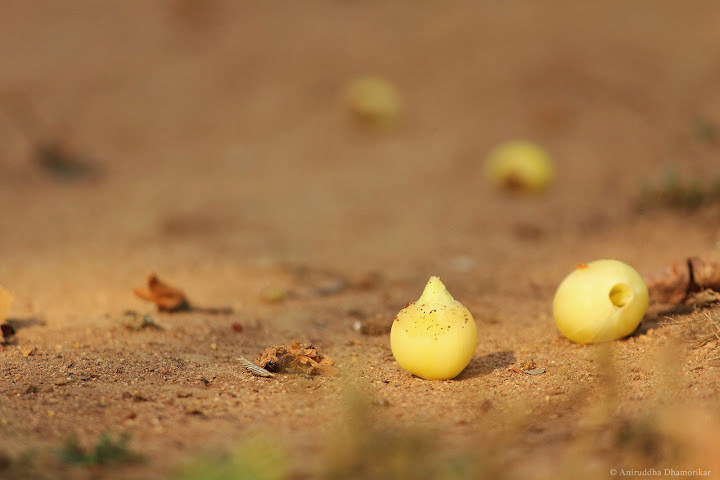 Young fruits of Mahua coincide with the sprouting of tender leaves. The seed is almond-shaped, inch-long and brown in colour with a glossy coat. Mahua’s ecological importance has been known to the tribal communities for centuries, when they relied on the flower and seed for self sustenance as well as trade. But it was with the coming of the British that its economic importance was recognized, and today, Mahua flowers and seeds are exported nationally for local distillation and oil extraction. “Before I left India, the agents of Bombay mercantile houses were probing the recesses of my district (Nimar) in search of various articles of natural production which had suddenly become valuable for export, such as the oil-yielding seeds of the Mhowa (Bassia latifolia), and the pure gum of the Dhaora (Conocarpus latifolius, now Dhawa, Anogeissus latifolia). Altogether a new era has dawned for these "children of the forest." The trade, after a hundred years, is still a continuous process intermingled with summer and the people. Currently, it has been set up efficiently and is constantly monitored by the government. 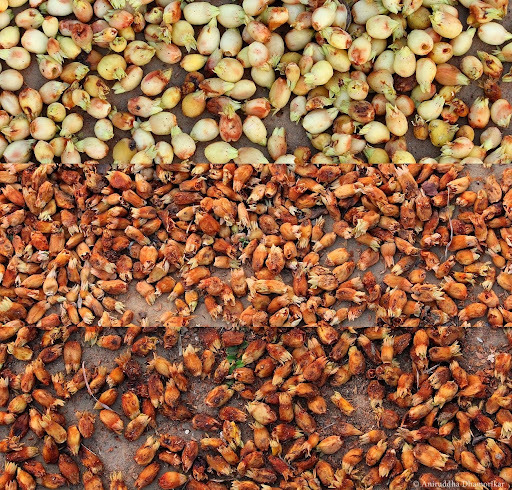 The process of harvest-to-market is rather simpler in case of Mahua. The fresh, wet flowers, when collected, are dried by the owner of the trees in his house. He then sells the sun-dried flowers to a merchant. Home-made drying of Mahua f lowers. They are usually laid out in a clearing in front of the house and left to sun-dry. I was informed that this season, the dried flowers were sold for Rs. 20 per kg to the merchant. Merchant in turn stock up the yield and sell it at a profitable price. This year it was sold for Rs. 30 per kg to the licensed brewer, whether within the state or across India. The brewer generally sells the refined product for Rs. 40 to Rs. 50. In case of the seeds, they are harvested and sold for Rs. 20 per kg, which the merchant then sells off to companies manufacturing oil. This complex set-up is not a mechanic but a purely ecological mechanism set in place naturally when a few factors, such as the Mahua tree itself, the people, the bees, and other animals came together. Indeed, it is natural, but not foolproof. If you owned a number of Mahua trees, you wouldn’t only protect your possessions from thieves, but also wild animals that have every right to claim the tree as you and me. Baronet (Euthalia nais), a not so "brute creation" of Forsyth's claiming a fallen flower. Animals from elephants to deer to wild-boar to an ant, cherish Mahua equally. “If I were alone I would change my hunting-grounds now, before the others began to think. And yet – hunting among strangers ends in fighting; and they might hurt the Man-cub. We must wait and see how the mohwa blooms. The droughts when Mahua does not flower are the hardest. This season’s yield was considered to be far too less, although the summer was not so harsh, neither was water too short. In an ideal season, the forest floor would be covered in the icy-green flowers of Mahua, people said. Although no heavy economic losses have been broadcasted yet, the villagers found this year’s income from Mahua too small. It is perhaps associated with a prolonged monsoon, which extended well into October, and the prolonged winter which extended well into February. We’d not know the reason in a season, but it is enough to give us an idea of how vulnerable is our dependency upon nature. What will it be like in the future, I always wonder, for the past hundred years have been more-or-less the same. How will climate change impact this bond between Mahua and her people? How will we adapt if Mahua cannot? The ecosystem services provided by species like Mahua and its associated animals is easy to be calculated in monetary terms – but the people of the past did not need to calculate it in monetary terms – they simply knew, and that is all that mattered, and shall matter. Yet if one is to conserve such ancient tales, it is the hour to take note of man’s various bonds with nature. Flowering of a particular plant also depends upon the intensity of light that is received by it. Very well written, 'illustrated' (as usual) . In earlier days people grew as a part of nature. They were happy. Now a days we consider nature is 'something' different than us. And the result is in front of us. Excellent images and post - almost a thesis!! A wonderful tree that is at the centre of the lives of the people of the region. A perfect example of how trees support humans..
Nicely narrated, as always.. May I take some photos from your article? Thank you Kallivalli, you may use the photos as long as they are not for commercial purposes. Your expressions and illustrations can make readers fall in love with nature, over and over again, Mahua in this instance. Keep writing! It feels more smoothening while reading. I was randomly searching for poems on Mahua and ended here. We tribals have lot of connection and affection with Mahua tree. Once again thanks for sharing.